The EuroBin 1210 is made from virgin polypropylene to ensure high-quality performance throughout its life cycle and is the preferred material for the automotive packaging industry. The EuroBin is 100% recyclable with only polymer type for all plastic components unlike other plastic bins on the market that use a number of materials and are made from a mixture of polymer types. Repair and maintenance is often a time consuming and expensive task when returnable plastic bins are concerned. The high visibility fork straps (runners) have been designed with the forklift driver in mind to help visibility and with a simple mechanism in order to quickly replace damaged fork straps reducing the time bins spend out of the supply chain by 65%. According to Macro Plastics, EuroBin is the safest and most economical product of its type on the market today. Additionally, as it does not inter-stack with other bins in Europe, it is safe from theft and loss in the ever-increasing used bin market. EuroBin weighs just 52kg with a capacity of 900kg – driven by the demand from OEM’s and tier suppliers for a 900kg bin to transport powertrain, body and white as well as trim components. This feature also supports the desire of automotive supply chain decisionmakers to reduce emissions and improve the green credentials. Additionally, the increased height of the bin increases bin capacity, allowing tier suppliers to transport more parts and components per bin using the existing footprint that is currently in use, therefore removing the need to make any related modifications or changes. 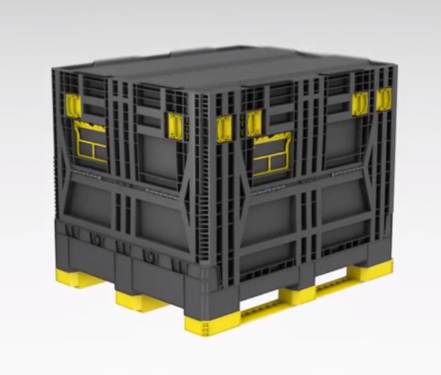 The plastic folded bins can be stacked three high in erect with 78 bins per European Megatrailer. When folded, the bins can be stacked 10 high giving 260 per European Megatrailer. By increasing the storage capacity of the bins as well as the size of the bins in transportation, the number of trailers required is significantly reduced therefore reducing the environmental impact and emissions.